I’ve been successfully using the Agile test quadrants in retrospectives to stimulate in-depth team discussions on software quality and its improvement. The quadrant model was originally developed by Brian Marick, and then popularized by Lisa Crispin and Janet Gregory in their book, “Agile Testing: A Practical Guide for Agile Testers and Teams.” For me, the quadrants capture all the complexities of software quality and can help reduce communication gaps between product owners, business analysts, developers, and testers. As there’s always room to improve, the model works for both mature teams doing continuous delivery as well as newer teams. Most teams I’ve worked with found they had a “blind spot” for one or more quadrants. For my retrospectives, I use an adaptation of the quadrants by Gojko Adžić, but you can use any version you like. I usually begin by introducing the format of the workshop and giving a bit of history on the quadrants, which takes about five minutes. There’s often an “aha” moment for participants when they see the quadrants for the first time and recognize the blind spots in their way of working. This usually takes about 7 to 10 minutes. Let the participants do this on their own and make sure they don’t start discussing right away. At this point, it’s all is about perception and all input is valid. Next, ask everyone to write their scores on a sticky note with their initials and place it on the horizontal lines next to each quadrant. Now a discussion can be started based on the different values given by the participants. 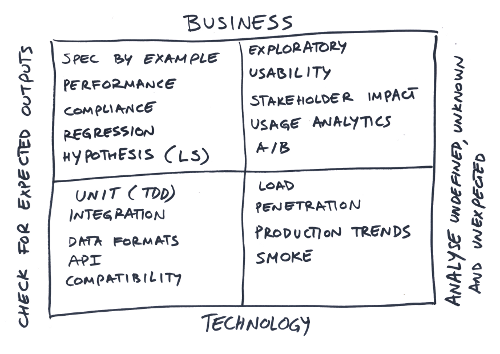 Try to come to a consensus on effort spent and quality for each quadrant. Write the main observations and problems on sticky notes with a distinct color from the scores and put these aside. Timebox the discussion per quadrant to 15 minutes max. If specific development work is needed, then you will need to negotiate with the PO. It’s recommended to always have the PO present to represent the business. Gather the issues, measures, and their priority. Make sure relevant items get added to the DoD. Once you’ve done the exercise once with your team, it’s a good idea to repeat it every two or three sprints, as long as it helps you improve. You could also do variations, such as focussing on a single quadrant. Keep it fresh and improvise!